I entered the Broxa Breaker as it was a brand new event, a reasonable price at just £15 for the half marathon & for a good cause, The Army Benevolent Fund & Macmillan Cancer Support. 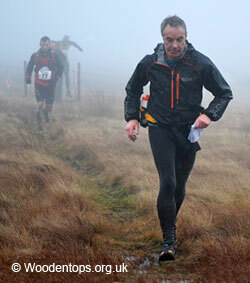 The race was part of Hardmoors so I knew this would not be an easy flat route. Numbers were to collect behind the Village Hall in Scalby on the day, I was a bit concerned as there did not seem to be that many participants gathered for the race, however, I got my number & started to get ready for the off. The half marathon set off at 9.45am. Not far in to the race the I got to the first hill & thought oh dear, I must admit I did struggle on this & was right at the back, but a mile in I saw a friendly face, my partner, waiting for me to help me get round, thank goodness. The route then took us across farm land & more hills but I did appreciate the beautiful scenery & was glad of my running support as it seemed a lot of the markers had been removed by persons unknown & I am not the best at reading maps. Around 3 miles in I saw one lady dropping out & heading back to the start, but, I could never drop out of something I had already started unless I was physically unable to carry on, so we plodded on, running through woodland, streams, a ford, mud & more hills. There were 2 check points offering refreshments & sweeties which I was very grateful for. There were a few people who got lost on this route mainly due to the markers being removed but I am glad to say I found my way back safely ... with help. I must say although this was a very tough race, I did really enjoy it & the views were absolutely amazing, and it was 13.1miles not any extra as with most Hardmoors races. At the finish I received a goody bag & a medal, there were also cakes, etc on offer for runners too. I really hope this race goes ahead again as I would definitely put in for it. Unofficial time 3hrs 35mins. Job done. This is a race I've always wanted to do but somehow it has always clashed with cross country. This year it did overlap with the XC Nationals, so with the number of Striders heading to Dufton this year the Striders XC team was probably smaller than it could have been. We added up to a total of 9 Striders, both runners (Anita, Debs, Diane, Catherine, Nigel, I) and a bunch of injured but enthusiastic walkers/cheer-leaders (Mandy, Joan, Jan). Mandy and I arrived early, but there was already a solid queue building up inside Dufton Village Hall waiting to register - and a cake stall at the back of the hall selling delicious cakes and tea. The other Striders arrived soon after and there was enough time to take a group picture and scuttle round the village green a bit. High Cup Nick is quite a popular fell race so there were around 350 runners setting off from the village hall after a safety talk, where I had to guess the content (don't get lost/shot/run over by sheep?) as I was standing quite far back. We set off along the village road and then turned left towards Bow Hall Farm. The field was similar to that of Esk Valley Fell races in North Yorkshire - reasonably experienced runners but with a variety of paces. After the farm, we turned left onto a footpath following a stone wall along the fields for about 0.5 mile and then turning left onto a wider track. After a while the route turned right onto a narrow path with Stud Gill on the left and a tarn on the right and onto moorland with a tow of runners heading towards the majestic whin sill rocks at High Cup Nick. We kept running high with the footpath only gradually descending towards a stone wall where the route turned to follow the wall. Fellrunning and dry feet don't go well together, so now it was high time to get our feet wet by wading over the water-covered stepping stones. We continued trotting along the path and after crossing a little bridge we ended up ploughing through a field of large boulders. I was concentrating on keeping up with the lady in front of me, as the slope gradually steepened, following the steps in the clay. I had recced the route earlier, with my keen dog helpfully pulling me up the slope, but now I had to resort to a bit of scrambling. I didn't stop to look round me this time, but I knew from last time that the views were fantastic, with the beck meandering down the valley and with solid wave-shaped cliff formations on both sides. This race failed the Scott Watson test of travelling time vs race length, in that he generally insists upon a ration not much greater than 1:1. However, this was the nationals and an exception deserves to be made for the right race, which this most certainly was. Seven Striders were joined by a similar number of DCH runners on their very empty bus, leaving Maiden Castle at just the right time to spy several parkrunners looking a little sheepish when offered a seat, including Rob Everson, late of this parish and running strongly again. The journey to the East Midlands was unremarkable, the bus roomy and the day bright all the way to Donnington, where we pulled in under the flight path to the airport and next to the famous racetrack, where we found that Geoff Watson had already set up the DCH tent amongst over a hundred others from as far as Morpeth, London, the South West and and the Welsh Borders, and was contemplating turning out for them with less than 100% enthusiasm. Think the usual XC atmosphere, but more so: mass enthusiasm and personal reluctance. 1420hrs came rapidly and we watched Steph and Susan recede into the distance, swallowed by hundreds of other runners as the starting funnel narrowed and the sharp right took them out onto the course proper. The next 40 minutes were unpleasant, nerves increasing despite the knowledge we didn't even have the numbers to make up a team, then 1500hrs was upon us and, from the pens (13 for Striders, tactically-positioned behind the faster chaps) freedom rang with the shotgun blast and it was time for us to cross the grassy, rutted field to the copse turn and get out there. The course, with hindsight, was a beauty: one bottleneck of any note for those in the middle of the pack (the turn from the start onto the main course) and a design that allowed spectators to see multiple turns and loops at once from one of several vantage points. It started fast, with a left-hand bend taking us through an uneven turnip field, a little drop off to the right, a sharp left and climb then two descents in succession, one a straight, fast plunge and one a gentle left-hand curve lasting a good 400m. Then the fun stopped: the easy bit was over and the back half of the loop began, with the ground getting wetter, the mud thicker and the overall theme becoming 'uphill;' reader, it was here (on the final left-hand curve of lap 1, this one giving the runner the option of 'direct-but-slow' or 'lengthier-but-firmer') that I realised I'd made the classic XC mistake of letting adrenaline hold me to a pace I could not sustain. Lap 2 was not fun. Let's not talk about lap 2, other than to state that a few runners appeared to be having even less fun than me, as they were simply walking off the course with looks that did not indicate a good day. Let's go to lap 3, where the race stabilised for me, in that I was no longer going backwards and was even regaining a few of the places lost on lap 2) and the end was in sight - literally so, from a couple of points on the course, when my eyes could be taken off the ground. By now, the ground was getting much more churned than it had been earlier, the air was colder and the light was fading a little, but each and every turn was taken with the knowledge it would be the last, the descents were joyful again and the climbs were productive for me in terms of places, every vest seen at NEHL fixtures particularly satisfying. 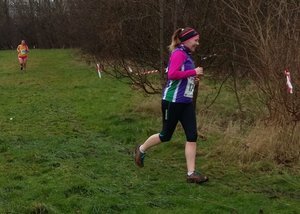 It was something of an anti-climax to find that the finish was long, straight and flat (though very muddy) and that unfortunately a handful of others had a better sprint for the line than I did. A few minutes later, David Gibson crossed the line, with Geoff, Mike Hughes and Mike Bennett after him, one short of a team yet all, once again, part of a satisfying day's running. A very quick change was followed by a walk back to the bus, the drone of motorsports still renting the air and the passengers flying a couple of hundred metres above doubtless wondering what was unfolding below them as they came in to land. Back in Durham a couple of hours later, walking up North Road on 'payday Saturday,' we pondered if anyone we passed would understand why we'd done what we did that day. We thought that they probably would not. Which is fine, as nor did we. But we had done it, and would do so again in a heartbeat. This was my sixth time running this event. They vary the course, but this was the third time I had run this particular route. However, the last time I ran it was 2013 so I could not picture the exact route. I find having different routes appealing, you never quite know what is coming next. 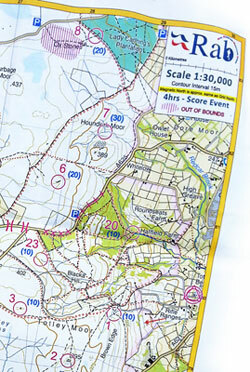 The route was superbly marked with lots of tape, a map, a gpx file and marshalls on the busy road crossings. We were both expecting lots of mud as this is fairly normal for this event. However, there was very little and you could mostly avoid it. There was a bit of a breeze in the second third, but nothing very strong. Plenty of gates and stiles, especially on the 16m route that Melanie did. As usual the start and finish was in Harby and all proceeds went to the local primary school. Melanie and I were starting at the same time and we would follow the same route for the first 4m. The start was a little crowded and once out of the village we crossed some muddy fields and climbed up the escarpment for the first time and ran alongside fields and on farm tracks - the vast majority of this route was off road with just the odd short road section. To our surprise the sun was coming out through the clouds and we were warming up quickly - it had only been about 2 degrees when we started. After Melanie and I parted, I went through the first of many pretty villages. Some of these had checkpoints that were as usual laden with home baked food. I was starting to tire at about 16m which was a bit disappointing. I had been eating cheese sandwiches at the checkpoints and maybe I needed a sugar boost. I certainly felt better after some cake at the next checkpoint. Another climb up the escarpment and into the woods whether I started to catch some of the 16m walkers who were following the same last 5m as those on the 26m route. However, there didn't seem to be so many of them this year. Then I arrived at the last checkpoint and it was like a party. There must have been about twenty walkers there chatting away. Apparently they had cheese biscuits and stilton on offer at this checkpoint, but it was so busy I didn't spot it. The last four miles were pretty easy, more paths through the woods with lovely views to the north and then a lovely downhill into Stathern and then across fields towards Harby. This section normally has a pond where you cannot avoid wet feet, but it basically wasn't there this year it was so dry. I made it back in just under five hours thirty minutes which was pleasing. As usual, there was soup and a roll followed by bread and butter pudding and custard waiting for me at the finish - there are lots of opportunities to eat at this event ! Melanie enjoyed her run though she was a bit frustrated by some of the queues at some of the stiles, ten minutes at one stile ! She had time to go back to the hotel in Melton Mowbray, shower, change, have some coffee before returning to pick me up in Harby. The waterfall coming down from Easedale Tarn was a raging, white torrent! Even though we were about a mile away, from our windy vantage point on the top of a small knoll, we could see the water moving; jets of white falling water. The beautiful surrounding bracken of the hillside was deep red, dotted with a few windswept trees, and higher up the tops of the fells had a light dusting of snow. It had been raining heavily all day. After driving over to Grasmere from Durham this morning, and a café lunch in Grasmere village we had put the kids in wellies and full waterproofs and splashed/waded our way a mile along the path towards Easedale Tarn in the heavy rain and blustery wind. The path was more of a stream, the adjacent fast-flowing stream having burst its banks in several places! This was the day before the Grizedale marathon, and although I was now enjoying being out in the rain, I would prefer it not to rain during the event tomorrow! At 7am, still dark outside, and after a rough nights sleep in the youth hostel (I'm not a good sleeper away from home) the high energy 1980's disco alarm went off on my mobile. The kids jumped out of the bunk beds and started dancing. (How do kids do this when they were snoring 3 seconds ago?!). ...I moved the curtain and took a peak out of the window..it had stopped raining! Yes! ..I felt excited! 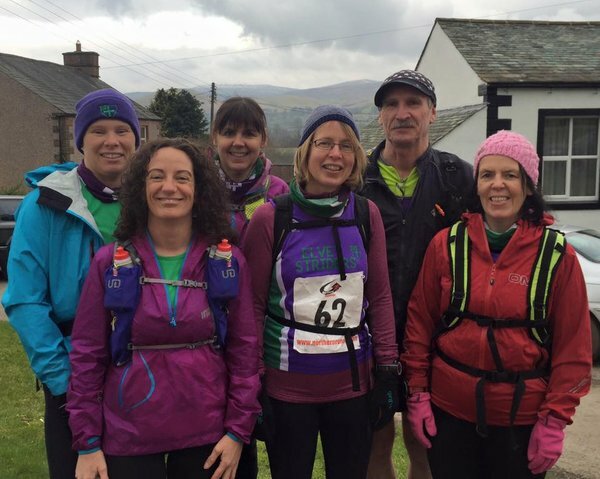 My plan was to use the Grizedale marathon as a long training run for the Manchester marathon in April. A change from running my usual long run routes around Durham, and a good excuse for a family weekend break in the Lakes! So I was planning to run at an easy-steady pace. Chill a bit and enjoy the scenery and the social aspect. We were all assembled at the start at the Grizedale Visitor Centre. 5,4,3,2,1 GO! boomed the loudspeaker! We were off! The crowd of runners moved forwards through the inflatable start-line arch! The route wound up and up and up into the deep Grizedale forest! The track was lined with tall dark green branchy conifers. The pine smelt fresh. I found myself in a group going at a nice steady pace, just the sound of our breathing and our feet on the forest track. This was nice. Relaxing! Peace and quiet from the noise of the kids in the car earlier! At around 6 miles ish the track turned into a deeply rutted path on the top of the moor above the treeline, with puddles and bog. I found myself behind a group of 5 lads. They kept leaping from side to side to avoid puddles/rocks/mud, as did I. Everytime I jumped to one side there was a guy who jumped right in front of me. He knew I was there but was just trying to find the best route. However it made me want to get past him. As soon as the path widened I waited for a gap and ran hard past them. Suddenly it felt fantastic going fast on the top of the moor! ..And also now I was past them I wasn't going to let them catch me! I increased my speed to make sure of this and ran up and down, up and down along the very undulating narrow ridge path with a view the high snow topped mountains across the valley. Who-hoo! I kept going fast and passed another girl, then no-one for a while. The route went back downhill through the forest, great to keep up speed. After a quick jaffa cake at the first check point I caught up with 2 guys. We chatted a bit. One was from Yorkshire. He said he supposed the view was ok but it wasnt Yorkshire! Ha ha. Then 'Marathon Man' caught us up. 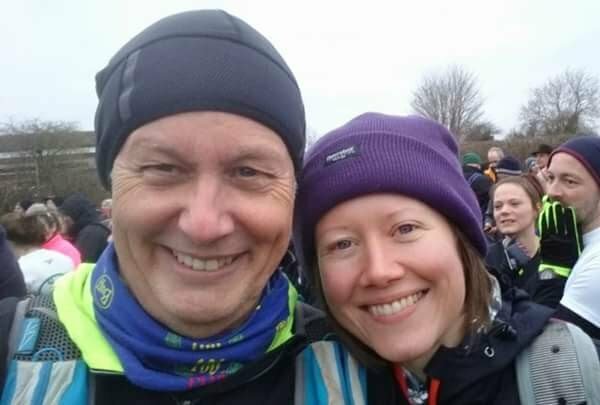 He was doing 52 marathons in 52 days! After talking he bade us farewell and sped off into the distance!! ..Nearly half way now. Mentally this marathon is a fantastic route, two loops of 13.1 miles each, so you know exactly where half way is. As a neared the half way point a couple came towards me peddling uphill on their bikes. They shouted out that I was the second lady that had passed them! ...Well, if that was the case, I was going to race! I needed to keep the pace up in the second loop. Not let the girl I passed earlier catch me up. The pressure was on! The second loop began with a steep climb up a boldery rain eroded path. It went over another ridge, down to and around the head of Esthwaite Water, past Beatrix potter, up into the wilds again over another ridge, this one a bit more exposed and windy (thanks Debbie for the buff!) then down through beautiful forest to the shore of Lake Windermere. The sun came out for a moment and the glimpses of sparkling water and moored boats could be seen through gaps in the trees. The regular rushing lapping of waves on the shore from the brisk wind could be heard. I spotted some runners ahead. One was tall and thin, and wearing a pink cap and top. Could this be the first lady?! I needed to find out! I Increased my speed! They were going fast and the path kept going over hillocks and round corners around the lake-side so they kept going out of sight! They stopped at the final check-point. It was a guy. Oh well! The final check point was amazing! A table with a large spread of cakes, peanuts, jelly babies and drinks! The marshall proudly declared he had made the flapjack himself and that it contained so much fat and sugar It would keep you going for 2 weeks! :) I thanked him and ate as much of it as I could in 2 minutes, then ran on up the hill. The final part of the route wound back over the ridges back towards Grizedale forest. With two miles to go I suddenly felt really tired! I tried as best as I could to keep up the pace but a few runners past me. There were a few fun stream crossings in the forest, ..but back on the forest track it seemed to stretch on and on! I must not let her catch me! She could be just behind me ! Finally a steep hill and the joyous sight of the roof of the visitor centre!! Just back down the boldery hill, onto the road, round the corner….and there was the finishing arch! Yippee! 2nd place was mine! ...and literally 2 minutes later the girl behind ran through the arch! … ha ha ha I had been right to keep on the pace! There was a small presentation in the visitor centre cafe afterwards. Everyone was very friendly and chatty. The first lady had finished 30minutes ahead of me, super speedy! My husband and kids arrived, the kids full of excitement as they had also had a good morning leaping about at the outdoor treetop adventure course at Brockholes. We were all hungry and enjoyed a hot lunch of juicy sausage bread buns with oinions and hot chocolate in the warm cafe! We arrived at Totley Moor sports club on the edge of the Peak District near Sheffield, now with the promise of good weather despite a gloomy earlier forecast and registered straight away in the Mixed Vet50 class. There was a very thorough kit check that included a compulsory bivvy bag each! (note to self: don't try to get away with less than all of the compulsory items as we would not have been allowed to start). We had four hours to gather as many points as possible so route choice was important to try to bag some of the higher scoring control points. We looked at the map together and agreed on the first couple of control points before heading straight up a hill and onto the fells almost immediately. I always need a decent warm up and my legs felt really stiff for the first couple of miles - I thought they were never going to get going. We got to the first control without any problem, then took a bearing to head towards the next; a trig point that was out of sight. As we got close to where we needed to be, Scott was distracted by a huge cairn that had several runners going to and from it. There was no cairn on the map but we headed for it anyway thinking that it might have been listed incorrectly. However, we knew it wasn't a trig point and that it was not quite where we expected the control to be. Needless to say there was no control kite there. Another lesson learned: not to blindly follow other runners. Next, we were looking for the start of a stream in a very boggy area with really deep, ankle wrenching tussocks. Scott said that he had never experienced anything as bad, and he's done similar events all over the country. I ended up face first, followed by several minor ankle twists and a fall onto my backside. It took us quite a while to find that lousy 10-point control which was visible only from one direction. Another runner was fairing no better and although Scott managed to get the control unseen, I, in my bright pink jacket, was blazing towards it like a beacon and the runner just followed me, pleased for the advantage. I couldn't believe that four hours could pass so quickly, and it was so much fun. 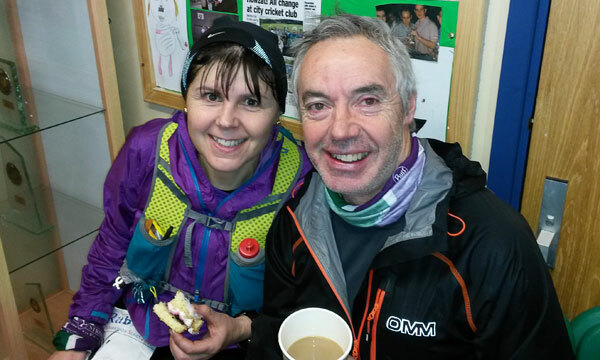 We finished the event off with homemade soup, tea and cakes at the finish…..after it had taken me about ten minutes to undo the new lace solution….maybe just a bit too secure! I am now enthused and am keen to complete the series of four….watch out Lake District; the Watsons are coming! This is a fell race that Chairman Paul has talked about on a number of occasions so I figured it was about time I checked it out. I must admit to being a bit apprehensive as the description of this race sounded quite dramatic and 19 miles is still quite a long way for me certainly in terms of racing, but I need to step up the miles so why not? 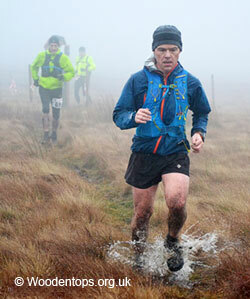 The Trog is hosted by Calder Valley Fell Runners and starts and finishes in Hebden Bridge. This meant an early start and a 2.5 hour drive. It's therefore useful to make sure your fellow passengers are good company....unfortunately I was stuck with Paul and Scott (only kidding). We put the world to rights on the journey there and back and ran a 19 mile fell race in between. We registered in the Cricket Pavilion at Hebden Bridge which was warm and dry and nothing like the weather outside which was wet and fairly cold. Everyone I chatted with at the registration warned me it would be muddy on the course and boy were they correct! The course itself is pretty undulating but actually quite runable for most of its length. It's a figure of 8 with checkpoint 1 also doubling up as checkpoint 11. The race started at 10 and myself and Scott got into a nice steady jog run on the uphill start. Paul said bye and that was the last we saw of him! Scott and I ran together as far as checkpoint 2 which was along side the Reservoir then on the really boggy stuff Scott pulled away. I managed to land in a bog and sank up to my knees. 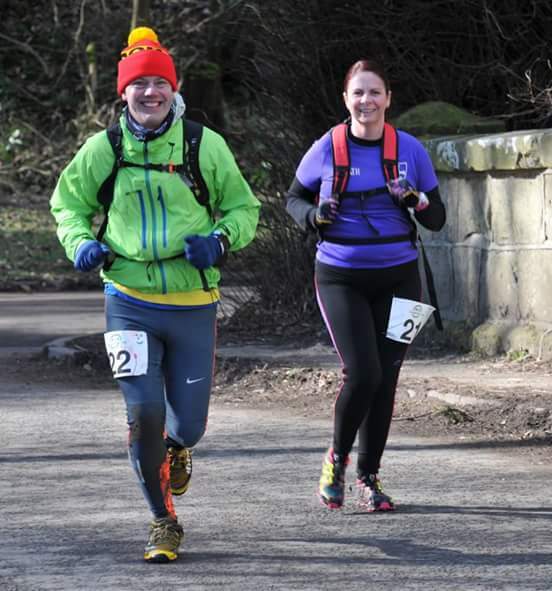 Some other runner helped me out and I struggled along never quite getting into a good running rhythm to checkpoint 5 with Scott around 200 metres ahead. The rain was fairly constant as was the mud! I was running in my waterproof jacket and hat all the way and never overheated. It was chilly. We finally got off the fellside for a while and onto some decent track around about checkpoint 6 and to my surprise I caught Scott up. Maybe I should go back to the roads? We ran together for the rest of the race. We also got into a good rhythm and managed to overtake quite a few runners in the small loop from checkpoint 11 to the finish. It was nice to hit checkpoint 11 and I think we could both sense the finish 4 miles away so that certainly gave me a boost and I quite enjoyed the last bits over the hills. The finish back to the pavilion was uphill and required a heads down plod and did feel a bit strange to be nigh on walking to the finish line. We did manage a jog round the cricket pitch and Scott let me cross the line first, he's a gent. We met Paul back in the changing rooms washed and dressed with a sore ankle after turning it again. We had soup, tea and cake and clapped the winners before getting into the car and heading home. I think it's worth a run if you fancy something a wee bit more demanding than our local fell races as it certainly felt like a step up in terms of terrain and severity. 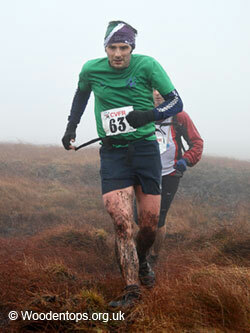 It would be a good intro to longer fell races before heading to the lakes district for the big ones. As for the copious amounts of mud? well I think Scott put it quite succinctly when he noted Wadsworth Trog? more like Wadsworth Bog!! Following on from Tom's account above here are a few of my observations about the race: Firstly it was 'grim' and that's not a word I use lightly when talking about the upland countryside we're lucky enough to be blessed with in this part of the world. It was cold and made colder still by a constant blustery wind driving the rain before it from start to finish. There was mud and bog of every depth, at every angle and of every sucking, sliding variety together with long stretches of heather that ripped unkindly at the legs of those of us who were hardy enough to wear shorts (Paul and Tom - not me). It had been a long drive to get there after rising a 5.30am for what turned out to be nigh on four hours of self inflicted punishment but when all comes to all I wouldn't have missed it. The company was excellent and the race made more interesting by being able to share it with Tom without having to compromise (or overly extend) my effort. Paul had to do his own thing because that's what you get for being so much faster! I'd made what I thought was a rather lovely map of the route that held up well in the wet conditions with the exception of a couple of points where the rain started to smudge the ink because I'd cropped the covering material too close to the edge. Although it's required kit, you don't really need one 'cos when you aren't at least up to your ankles in slime then you're often on a fairly good trail which means that you can be pretty sure of where you're going. It's well marshalled (well done to CVFR) so if you do feel that you need to navigate you're going to be a long way behind! However, for new races - particularly if they are long and demanding - I usually have one to hand so that I can gauge my effort, plus the discipline of staying in contact with the map gives me something to focus on other than my own discomfort. Talking about marshalling I pitied the poor guys and girls who had to put up with the 'gentleman' (and I'm ashamed to say I think he was a geordie) who was quite literally screaming abuse at them because he was being held up at a road crossing. You could hear him from a hundred metres away through the mist. I've never heard anything like it. I'd have had the authorities check him out because nobody can be that angry without it spilling over into other areas - nasty man. Not sure that I should be giving it away (though it's there on the map for anyone that wants to look) but the finish on this one is set up as a bit of a 'sickener'. After running a long way down towards Hebden Bridge in the valley bottom (incidentally there is a nice view across the valley, of Heptonstall church where, Paul informed me, the poet Sylvia Plath is buried) the course turns steeply uphill over more fields. However, it was so muddy this year that the gains to be made from running were simply not enough to justify the effort in my opinion, so it was somewhat bizarre to find ourselves walking towards the finish where normally you're trying to prevent yourself from throwing up or having a cardiac arrest! After having been made to trail round a waterlogged cricket pitch (one of the very few flat bits of the race) it was nice to be able to get a shower followed by tea/coffee and very nice selection of cake plus soup (of no specific flavour as far as I could tell) and a bun - all for the ridiculous sum of £8.00 (proof that it's still not actually necessary to spend half a month's salary if you want to give yourself a bit of a challenge). A good day was very definitely had by all and we still managed to get back for the second half of the rugby! For harrier league mud lovers (over the age of 35) who have been deprived, this was the place to be - a wet, damp and muddy Saturday afternoon in Wallsend for cross country. It could have been the harrier league, but smaller and with no tents. It was where we had the harrier league many years ago. A select band of striders made it to Wallsend for the North East Veterans championships. I arrived, having driven through the wet grey mizzle that was Saturday morning in time to see the women and over 65 men and give a cheer to Fiona - who looked like she was giving it her all. Her summing up at the end suggested the downhill was OK but the uphill was for walking. I met up with Jason - who is just returning to running after a break of a couple of decades and I think his first cross county outing for striders. The atmosphere at the race was friendly and low key - until the start and the leaders setting off like whippets - the mud did not seem to have the same effect as it had on me. We had three laps, each of which included a straightforward descent, a slightly greasy descent and two uphill sections of slippery mud - nothing if you are used to hill races I suspect, but taxing enough. Fiona was right - I ended up walking for a short stretch - but so was everyone around me. One of the good parts of the veterans race is that you run with your age group on your back and as far as I was concerned if it did not say 55 then I was not too troubled (except when a couple of 60s came past - but that will be me next year.) The course allowed a couple of opportunities to see the race so it was possible to give each other encouragement and thanks to Fiona for the cheers. After race was catered for with hot drinks and the results did not take too long in arriving, apart from the age group team results. Not surprising considering the complexity of trying to work out all the different age categories. Unfortunately striders did not reach the podium on this occasion but hopefully a good time was had by all. Maybe next year.